Hi everyone! I apologize for my overdue blog post. 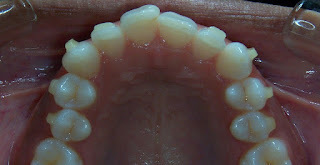 I am currently halfway through aligner 9 and noticing some changes. According to my simulation, my anterior teeth are all being pushed forward to create room for movement. The posterior molars will not be shifting because they are already aligned. My once inseparable lower front teeth now have an even larger space between them! I'm definitely not used this. Although its 100 times easier for me to floss in this area, it's also the number one food trap! I've also noticed that my smile is starting to look a little different now that the teeth are slightly pushed forward. A few people have also commented on this. It doesn't really bother me because I know it's part of the process. As for my attachments, they are not as white as they were in the previous pictures I posted. I am an avid green tea drinker and as we all know, tea in a culprit for staining teeth. I'm also East Indian, so a lot of our ethnic foods stain easily. My attachments are slightly stained, but nothing out of the ordinary. I also try to drink all my liquids through a straw to prevent staining. 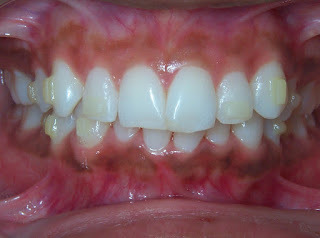 I noticed that using a whitening toothpaste directly on the attachments reduces the staining slightly. I've been using whitening toothpaste for several years now with a Sonicare electric toothbrush. I brush for the normal 2-3 minutes and then spend an extra 30 seconds - 1 minute just on the attachments. This stain reducing method may not work for everyone, but it has been for me so far. Here are some progress photos that were taken a week ago. By the way, no one has noticed the aligners yet! I just got my first set of aligners yesterday with 9 attachments. I don't feel much pain except on a few teeth (at the gums). I feel more discomfort, like I want to remove them and scratch my teeth. When I take them off to eat my teeth feel numb. Did this happen to you? How did you deal? I'm also addicted to green tea, girl! :P Green tea is also able to help reduce symptoms of periodontal disease which is due to the presence of the antioxidant, catechin. As a matter of fact, Dr. David Cochran, DDS, PhD, President of the AAP and Chair of the Department of Periodontics at the University of Texas Health Science Center at San Antonio stated: "That is why it is so important to find simple ways to boost periodontal health, such as regularly drinking green tea – something already known to possess certain health-related benefits."